Rose hip oil is most commonly used as a carrier, or base, oil for the use of aromatherapy. Carrier oils and essential oils are used for their healing benefits. Drops of essential oils, healing essences taken from plants, are added to the rose hip oil to dilute them. When essential oils are by themselves, they can be too concentrated and can cause side effects. Carrier oils, such as rose hip oil, dilute the essential oils so they can be applied to the skin. Carrier oils also balance the essential oils when they are mixed together. Prepare your rose hip oil to be mixed. Take a container, preferably glass, that can be used to mix the oil and essential oils. Measure the amount of oil you use by tablespoons as you add it to the container, so you will know how many drops of essential oils to add to your base oil. Add essential oils to your rose hip oil. Although rose hip oil can be rubbed into the skin on its own, it is generally used as a carrier oil blended with essential oils. For every tablespoon of rose hip oil, add 6 drops of one or a blend of essential oils. Mix the essential oils with the rose hip oil, and massage some of the blend into your skin. Pour the extra oil into a dark-colored glass bottle with a lid. If you are going to store extra oil, keep it in a dark bottle in a cool, dry spot, so the oils are not corrupted. Rose hip oil has its own health benefits that can add to the benefits of the essential oils. Rose hip oil is beneficial for your skin; it has properties that can improve wrinkles, as well as moisturize and regenerate your skin. Rose hip oil is made from the seeds and hips of the rosebush. 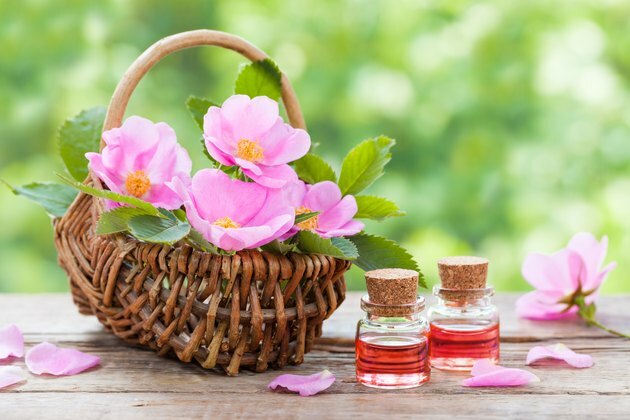 Rose hip oil is especially beneficial for older skin. Essential oils are very concentrated and should always be diluted before you apply them to your skin. Dilute them in water or oil. In case you are allergic to certain oils, do a spot test on your skin before applying the oils to large areas of skin. Consult with a certified aromatherapist for recommendations on using essential oils.